The Virginia Bar Association established a portraits committee in 1928. The bar hoped to encourage judges’ families and local bar associations to donate portraits to the small collection in the courthouse. In 1943, following a disagreement over the quality of portraits accepted by the court, the State Art Commission recommended justices have their portraits painted from life. In 1956 the association established a special fund to accept tax-exempt donations for portraits for presentation to the court and donation to the Commonwealth. The expense became part of the bar’s operating budget in 1958. 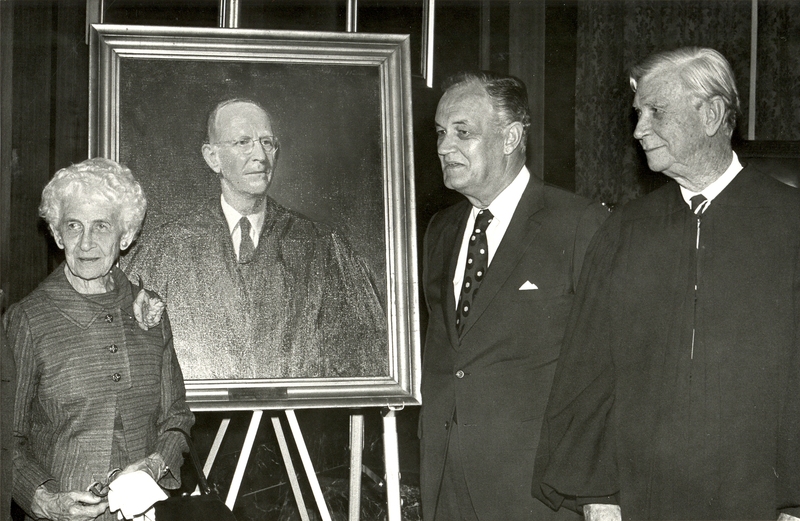 The portrait of Chief Justice Edward Wren Hudgins, completed in 1958 shortly before his death, was the first portrait commissioned by the bar. Portraits are presented at the winter meeting of the Virginia Bar Association and hung in the courtroom when a justice retires. A color brochure showing the current location of portraits can be downloaded and printed. In 1998, Governor George E. Allen issued an executive memorandum assigning the Library of Virginia responsibility for the care and oversight of artwork of the Commonwealth exhibited within the Capitol Square area. Today, all but 17 of the judges who have served on the court since 1779 are represented in the collection. Members who of the court not represented in the portrait collection are Dabney Carr, who served from 1824-1837; Paul Carrington (1779-1807), Richard Cary (1779-1788), William Roscoe Wilson Curle (1779), Bartholomew Dandridge (1779-1785), William Daniel (1846-1865), James Henry (1779-1788), George Hay Lee (1852-1865), Robert Carter Nicholas (1779-1780), Richard Parker (1788-1789), Richard Elliott Parker (1837-1840), Alexander Rives (1866-1869), Lucas Powell Thompson (1866), Benjamin Waller (1779-1785), and the three judges appointed by the military commander in 1869: Horace Blois Burnham (1869-1870), Orloff Dornan (1869-1870), and Westel Willoughby (1869-1870). Sources: Executive Memorandum 1-98, Care and Oversight of the Art Collection of the Commonwealth Exhibited in the Capitol Square Area, cited in Barbara C. Batson and Tracy L. Kamerer, A Capital Collection: Virginia’s Artistic Inheritance (Richmond: The Library of Virginia, 2005); Proceedings of the Fiftieth Annual Meeting of the Virginia State Bar Association, August 3-5, 1939 (Richmond Press, Inc., 1939), 102-103; Proceedings of the Fifty-third Annual Meeting of the Virginia State Bar Association, August 6-8, 1941 (Richmond Press, Inc., 1941), 82-83; Proceedings of the Fifty-fourth Annual Meeting of the Virginia State Bar Association, August 5-7, 1943 (Richmond Press, Inc., 1943), 90-91; Report of the Committee on Portraits of Justices, Etc., Proceedings of the Sixty-sixth Annual Meeting of the Virginia State Bar Association, August 2-4, 1956 (Richmond Press, Inc., 1941), 80-81. State Law Librarian W.W. Scott documented the portraits in the courtroom in 1919; see “Roster of Judges of the Supreme Court of Appeals of Virginia, 1779-1919,” The Virginia Law Register New Series, Vol. 5, No. 3 (Jul., 1919), pp. 185-188. There were two busts in the courtroom as well, of William T. Joynes, who served from 1866-1869 and 1870-1872; and Robert Stanard (1839-1846). Information about individual portraits can be found in the minutes of the Committee on Portraits of Justices, published in the proceedings of the annual meetings of the Virginia State Bar from 1939 to 1971; in the online catalog and portrait files of the Library of Virginia, and in Portraits and Statuary of Virginians Owned by the Virginia State Library, the Medical College of Virginia, and Other State Agencies, by Ray O. Hummel, Jr., and Katherine M. Smith (Richmond: The Virginia State Library, 1977). In 2008, photographer Robert Boag created digital images of the portraits hanging in the courtroom and foyer of the Supreme Court of Virginia for the publication, The Supreme Court of Virginia: Historical Portraits of the Justices, 1779-2011, published by the Department of Judicial Planning, Office of the Executive Secretary, in 2010 (now out of print). Unless otherwise noted, the images of portraits used on this site were created by Boag in 2008.